Selfishly, I wish that Broncos-Seahawks game had been what we saw in last year’s Super Bowl.1 Can you imagine? Peyton Manning intercepted while driving his team down for a game-winning score, only to launch an improbable 80-yard, no-timeout drive with 59 seconds to go before getting an impossible catch from Demaryius Thomas to tie the game on a two-point conversion. And then, for all that, Manning never sees the ball again, as Seattle wins the toss, marches downfield, and pounds the ball into the end zone for a game-winning score before their backup cornerback proposes on the field. Instead, we got the blowout in February and the fabulously exciting comeback on Sunday. Pour one out for narratives that never were. As impressive as Seattle was in absolutely shutting Denver down for three quarters, all I want to talk about is that drive. I mean, it’s one thing that it came against the most notorious pass defense in football, but the Broncos were also in the Seahawks’ famously terrifying home stadium with the game on the line and no timeouts. It would have been insane to pull off that drive at home against the worst pass defense in the league. I went and used the pro-football-reference.com Drive Finder to try to find similar drives to Manning’s from Sunday, and there just aren’t many. Looking at all drives where a team down by seven or eight points took over inside its own 25-yard line with 75 seconds or less left to go, other teams scored touchdowns on just two of their 76 previous attempts since 1998.2 The Broncos had a 4 percent win expectancy when the drive started. The two receivers on that side are running switch verticals, which is simply a pair of verticals (or go routes) in which the receivers change lanes at a given point during the route. Phil Simms noted after the drive that Pete Carroll must not have taught the Seahawks defensive backs “how to defend against that situation,” which is unlikely, given that it’s a basic concept and one the Seahawks ran on offense repeatedly last season. The idea is to get the outside receiver, here Thomas, to carry the cornerback (Maxwell) with his go route inside. That creates a window for Manning to try to hit Sanders with his throw to the vacated zone before Maxwell has handed off the responsibility for covering Thomas to the safety in the middle of the field (Earl Thomas) and returned to the sideline. A great cornerback might be able to read what was happening and cover Demaryius Thomas while sitting on Sanders’s route and remaining close enough to make a play on any throw to the outside — but there’s a lot of “and’s” in that sentence for a reason: It’s tough as hell. Maxwell just doesn’t have the ability and the awareness to do all that at the same level as a Richard Sherman, and the Broncos counted on that in targeting him on this drive. Manning was nearly sacked, but he found just enough space and had just enough arm strength to get the ball to Sanders for a huge play. Maxwell and the underneath linebacker, K.J. Wright, realize what’s happening at almost exactly the same time. Wright isn’t deep enough to contest the route, and Maxwell is a step too late in turning back toward the sideline. The Seahawks might have been bailed out with some pass pressure or a subpar throw, but Manning delivers a perfect strike to Tamme, who hangs on to tie the game. This isn’t some secret new trick to beat Cover 3 and prove the Seattle defense is really a bunch of frauds. It takes precise timing on the route combinations, a great quarterback, and an offensive line that holds up long enough for the routes to break. It looks simple in these two GIFs, but there’s a reason Denver didn’t make it look quite this easy for the first 59 minutes of the game. The Seahawks got steady pressure on Manning, knocking him down eight times, albeit with just one sack. They dared Denver to run and shut down the Broncos when they tried to do so, with Montee Ball & Co. producing just 36 yards on 20 carries. Of course, the Seahawks should be applauded for responding by shutting the door on Denver’s comeback with their next drive.3 Seattle won the toss and launched a 13-play, 80-yard sequence to win the game. It was the sort of steady drive that Seattle produces at its best, with two incompletions and 11 plays that resulted in a first down, touchdown, or kept Seattle ahead of schedule for a new set of downs. Those 11 plays each went for 5 yards or more, and while the Broncos were able to get to Russell Wilson during the second half, they looked gassed during overtime. Once Seattle picked up a third-and-3 and moved the ball onto Denver’s side of the field shortly thereafter, it felt like Denver was trying to avoid the big play and keep Seattle to a field goal. Instead, an incredible trio of blocks on the final snap created a mammoth hole for Marshawn Lynch, who waltzed into the end zone to end an entertaining rematch. Football’s best team through three weeks, unquestionably, has been the Cincinnati Bengals. One of three teams in the league left at 3-0, the Bengals tower over the competition, as their plus-47 point differential is better than that of their undefeated brethren in Philadelphia (plus-23) and Arizona (plus-21) put together. The team with football’s second-best point differential, Atlanta (plus-31), lost to Cincinnati 24-10 in Week 2 — a game in which kicker Mike Nugent missed three first-half field goals. In fact, the three teams Cincinnati has beaten this year — Baltimore, Atlanta, and Sunday’s victims, Tennessee — are a combined 5-1 in games in which they’re not playing the Bengals. As Chase Stuart noted on Twitter, the Bengals have trailed for just 51 seconds this season. It shouldn’t really be a surprise that a team coming off three consecutive trips to the playoffs would be among the league’s elite three weeks into the season, but there were plenty of reasons to worry the Bengals might not be the same team they were even one year ago. 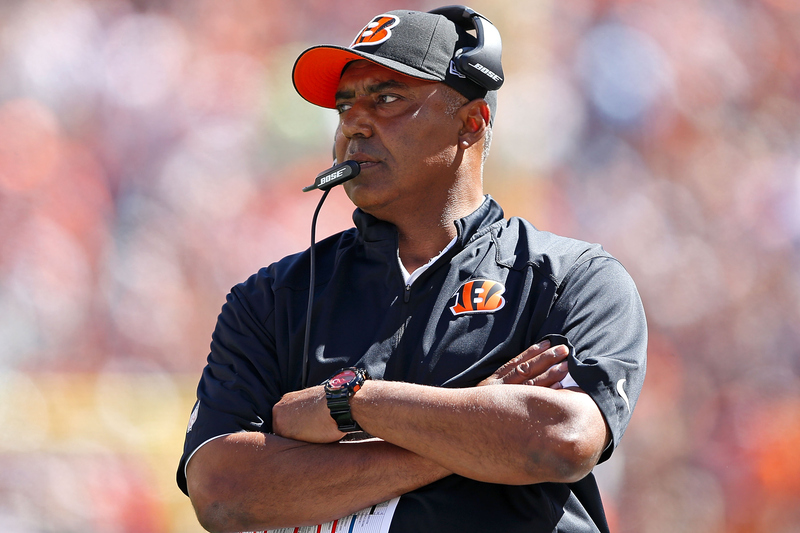 Marvin Lewis lost both his coordinators this offseason, with Jay Gruden and Mike Zimmer each taking head coaching gigs after years of solid work. Despite possessing ample cap space, the Bengals then bled talent during the offseason, losing key contributors like tackle Anthony Collins and defensive end Michael Johnson to free agency without signing any notable replacements. And star defenders Geno Atkins (ACL) and Leon Hall (Achilles) had suffered season-ending injuries during the 2013 campaign, with no guarantees about their health heading into 2014. And yet, even after losing Tyler Eifert to a gruesome elbow injury in Week 1 and spending virtually all of Week 2 (and bits of Week 3) without star wideout A.J. Green because of a toe problem, the Bengals have been dominant this season. How have they pulled that off? It starts with their pass defense, which has been incredible through three games. The Bengals were fourth in pass defense DVOA through two games, and after inducing Jake Locker into two picks as part of a day in which he went 17-of-34 for 185 yards, it wouldn’t be a surprise to see them push New England from the top of the pass defense charts when those are released later this week. Cincinnati has had the deepest secondary in football for years now under Lewis, and while first-round pick Darqueze Dennard just made his defensive debut at safety for the Bengals this week, Cincinnati hasn’t needed him. Meanwhile, offensive coordinator Hue Jackson has quietly crafted a fascinating offense around Green, Andy Dalton, and Gio Bernard. He mixed in heavy doses of the zone-read as part of packaged plays against Baltimore in Week 1, playing to Dalton’s familiarity with the concept going back to his days at TCU. Jackson looked past preconceived notions of what a franchise back should be and has turned Bernard into a workhorse, getting his star back 22 touches per game. Bernard has averaged only 3.4 yards per carry, but he’s been far more effective as a receiver, serving as a checkdown and screen threat. As for Dalton? The concern about him before the season was that he struggled mightily under pass pressure. This year, that hasn’t really been the case. Dalton’s QBR under pressure last year was 0.9; this year, it’s all the way up to 68.7. Sure, that’s in a small sample, and the traditional numbers (7-for-9, 166 yards) are skewed by two enormous runs after catches on pressured plays last week, but Dalton hasn’t looked as panicked as he did at his worst last season. He even had some bad luck this week, doing just enough against a unblocked rusher to set up a screen, only for his (imperfect but catchable) pass to bounce off Bernard’s hands for an interception. As for the Bengals’ opponent on Sunday, well, the Titans have officially exhausted the goodwill generated by their blowout win from Week 1. Locker was distressingly bad in stretches against Dallas last week, and while nobody has played well against Cincinnati this year, his performance looked especially ugly. He repeatedly sailed passes over his receivers’ heads and felt late on reads, none more notably than when he threw a terrible pass into the end zone just before halftime for an easy pick. When his receivers did get open, Locker didn’t see them, missing a wide-open Kendall Wright on what would have been a long touchdown pass. The notion that new head coach Ken Whisenhunt would somehow fix Locker seems to have been disproved; the problem is that the next guy on the depth chart is Charlie Whitehurst. Locker’s time isn’t up, but the band has begun to gather its instruments. The schedule is about to get much tougher for Cincinnati. The Bengals will take advantage of a much-needed bye this week to hopefully get Green healthy, although you wouldn’t have thought he was injured from watching him play Tennessee. When they come back, they travel to New England to play the Patriots, then host the Panthers, meet the Colts in Indianapolis, and finish up at home against the Ravens, who held that 51-second lead on the Bengals in Week 1. In what looks to be a paper-thin AFC, a split of those four games could be enough to keep Cincinnati in pole position for one of the top two seeds in the AFC, with the no. 1 seed possibly coming down to Denver’s trip to Cincinnati in Week 16. There will be some who write off the Bengals as irrelevant until the team impresses people in the playoffs, which seems ill-advised. The Falcons were a joke until they beat Russell Wilson in the playoffs (which seems pretty impressive right about now) and came within one Harry Douglas slip of making the Super Bowl. The Ravens blew playoff games in all kinds of crazy ways until Joe Flacco got hot one January and Baltimore won it all. You know how the sliding scale works: The Bengals won’t matter until they win a playoff game, and then when they do, they won’t matter until they make the Super Bowl, and then until they win it. If that’s what you want to take out of watching sports, go nuts. Until then, you’ll be missing out on a damn good football team. Blake Bortles, Jacksonville: Jaguars fans were right to give Bortles a standing ovation as he entered the field for his first NFL series; the Jags were already down 30-0 to a far superior Colts team. Playing start to finish in garbage time, Bortles showed aggressiveness and naïveté in equal portions, finishing 14-of-24 for 223 yards with two touchdowns and two picks. The stats barely tell his story. The problems were also the ones you would have expected coming in. Bortles was erratic under pressure and seemed to stop reading the field, although he was nowhere as bad as Blaine Gabbert was. The Jaguars are going to do a terrible job of protecting him, too, as he was sacked once and had a second sack — which resulted in a strip and a safety — wiped off the board by an illegal-contact penalty. Bortles forced a couple of throws, including a pass thrown as he was falling down, which never seems to work out for anyone. His first interception was understandable, as he went after Vontae Davis in one-on-one coverage and made a totally acceptable throw, but the second pick was worse. He didn’t see Greg Toler peeling off his assignment and reading Bortles’s eyes, and Toler took what was a pretty easy pick to the house. The Jaguars named Bortles as their starter going forward after the game, and I can’t blame them, but I also don’t know that he’s going to be much of a solution. The Jaguars absolutely have to keep him healthy and protected in the pocket, and their offensive line has been a total mess. They allowed 10 sacks last week and three in the first half before Chad Henne was finally benched, and those mostly weren’t Henne’s fault. Something of any note out of Toby Gerhart (who had nothing before garbage time and appears to be losing his job to Denard Robinson) would help. Head coach Gus Bradley said after the game that the team’s offensive linemen and wide receivers played better with Bortles in the game because he elevates the players around him, which makes you wonder why the Jaguars left him on the bench while they were getting the bejesus kicked out of them for three weeks.7 Let’s hope Bortles can make the players around him better, and that the guys around him don’t drag him down. 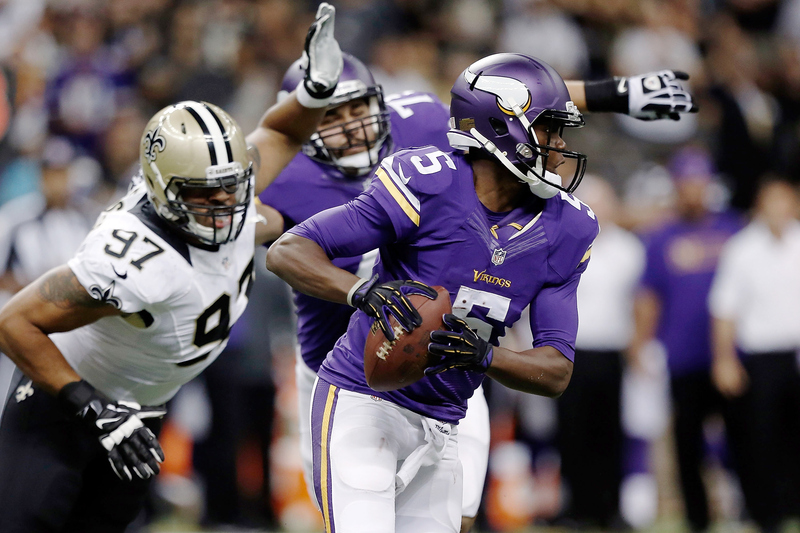 Teddy Bridgewater, Minnesota: Taking over for the injured Matt Cassel, who is out indefinitely with multiple fractures in his foot, Bridgewater went 12-of-20 for 150 yards against a Saints pass defense that has been generous over the past two weeks. His first big play was a 41-yard pass to Matt Asiata, with almost all of those yards coming after the catch. Bridgewater didn’t get to pick on benched corner Patrick Robinson, and he really didn’t take many shots downfield at all. It was hard to get a good gauge of his performance because the game plan was so conservative, and it remains to be seen whether Norv Turner will open that up with a less Cassel-esque passer under center. Bridgewater will need more help from his offensive line, which let the Saints through far too frequently. While he showed his preternatural poise under pressure and continually kept his eyes downfield against the pass rush, Bridgewater was forced too frequently to scramble and create space. In addition to a pair of sacks, Bridgewater ran the ball six times for 27 yards, a far cry from his days at Louisville, where he ran the football as a last resort. (One of those sacks came when left tackle Matt Kalil, who has been dismal this season, was knocked three yards into the backfield and tripped a scrambling Bridgewater.) He did pull off a number of nifty throws that the NFL dropped into this highlight package, but in all, this was a relatively anonymous performance from Bridgewater. That’s not necessarily a bad thing for a rookie. We’ll see more, both good and bad, as Turner opens up the playbook in the weeks to come. Kirk Cousins, Washington: Terrible! OK, just kidding. Cousins was fantastic Sunday, delivering a poised, promising performance and nearly leading Washington to an upset victory in Philadelphia. Cousins started hot, going 12-of-13 for 124 yards with a pair of touchdown passes on his first two drives, and he continued to play at a high level throughout the game. Picking on overmatched Eagles corner Bradley Fletcher early, Cousins moved around the field and repeatedly hit his receivers with catchable passes. And while Robert Griffin kept up a high completion percentage with a lot of checkdowns in Week 1, Cousins hit on his plays downfield, most notably a perfectly thrown deep post to DeSean Jackson for an 81-yard touchdown. So, I was wrong about Kirk Cousins, right? This week, I sure was. If this is the Cousins we see every week from here on out, he deserves to be the starter in Washington. We now have 81 pass attempts from this year that make Cousins look like a superstar … and 213 pass attempts from the last two years that make him out to be one of the worst quarterbacks in football. Those 81 pass attempts mean more because they’re in Gruden’s system, but it’s still not even half the larger sample of Cousins’s previous body of work. Cousins has shown a great arm this year, but the problem was never his arm; it was his decision-making and his propensity to cough up the football. He’s been great at avoiding those issues this year, albeit against two defenses that didn’t really pressure him much. The Jags sacked him twice, and the Eagles didn’t sack or even knock Cousins down once in 48 drop-backs. He threw an interception in the fourth quarter Sunday, but that looked to be more of a miscommunication with his receiver than anything else. Cousins will face a trio of spry pass rushes over the next three weeks in the Giants (who knew? ), Seahawks, and Cardinals. By then, we’ll have a much better idea of whether the new Cousins has much to do with the old one. Austin Davis, St. Louis: Have the Rams discovered the new Kurt Warner? Left for dead after having to turn to their third-string quarterback by halftime of Week 1, the Rams have rallied8 around their unknown backup, who has looked impressive at times over the past three weeks. After playing his heart out in a narrow loss to Dallas on Sunday, Davis is 68-of-94 for 754 yards with three touchdowns and three picks. He gives off that underdog vibe, like Davis is putting every possible ounce of moxie he has into each of his throws, and while he has been erratic, it’s been far better than expectations. With the help of Dallas cornerback Morris Claiborne, Davis reintroduced something to the Rams offense that has been missing in years past: the deep pass! Receivers who couldn’t get open deep during the Sam Bradford era suddenly found space with Davis around. That included Brian Quick, who beat Claiborne down the sideline for a 51-yard touchdown catch in the second quarter. That put St. Louis up 14-0, but Davis wasn’t done. He later hit Kenny Britt up Claiborne’s side for a 38-yard gain on a drive that ended in Jared Cook dropping an easy touchdown pass. Then, with his team down 10, Davis drove downfield and took advantage of a sleeping Claiborne to find Austin Pettis for a 4-yard touchdown catch. Sadly, the day ended when Davis overthrew his receiver and dropped a pass right into Claiborne’s hands for the game-saving pick. Claiborne giveth, and giveth, and giveth, and giveth, and then, almost by accident, he taketh away. Davis is certainly intriguing. At the very least, he deserves to hold on to his job for now, regardless of whether Shaun Hill is healthy. The Rams probably aren’t winning a whole lot this season, so why not see if they’ve stumbled onto a viable quarterback who makes the league minimum? Davis even gets the disappointing pass defenses of the Eagles and 49ers after this week’s bye, so the party could very well keep on going. Mike Glennon, Tampa Bay: Glennon went 17-of-24 for 121 yards and a touchdown while down five touchdowns or more against Atlanta last week. There’s no reason to hold the situation against him — he’s not supposed to be the guy tackling Julio Jones or Devin Hester — but it’s also probably smart to treat those numbers (against a bad pass defense) as just about irrelevant. Drew Stanton, Arizona: That’s 2-0 Drew Stanton to you! After the game, Stanton told Peter King, “My stats stink, and I don’t care,” which is the sort of thing you say when you haven’t played very well and your defense has allowed 15 points per game. Stanton was lucky to come away with the win after playing middling at best football against the Giants in Week 2, and while he was slightly better this week against San Francisco, his best drives invariably seem to require a handful of penalties on the other team to succeed. The game plan against San Francisco, especially in the first half, was very simple. The Cardinals wanted to get their receivers matched up one-on-one against a San Francisco defensive back and have Stanton try to deliver a catchable pass. Repeatedly throwing downfield to try to create jump balls, Stanton’s throws were off the mark and frequently dangerous. When the Cardinals buckled down on third down and merely tried to create a safe throw to the sticks, Stanton was much better, which was why the Cardinals were a combined 9-for-14 (64.3 percent) on third and fourth down. He also improved in the second half, leading two touchdown drives in the third quarter to eventually win the game. The first was an 85-yard drive highlighted by an underthrown bomb to Michael Floyd that required a heavy adjustment to be completed. The second drive saw the Niners pick up consecutive personal fouls for big hits on Stanton, the first of which comfortably qualified as a very questionable decision. It was brave of Stanton to stay in, and when he used two passes to convert a second-and-30 in the fourth quarter to set up first-and-goal, it was hardly his fault that Larry Fitzgerald fumbled and gave the ball back to San Francisco. Of these six, I think Stanton will have the shortest leash. Carson Palmer is not great when healthy, but Stanton has also shown the least upside of the six quarterbacks on this list. It wouldn’t be a mistake for the Cardinals to turn the job back over to Palmer if he recovers during their Week 4 bye. The carousel might not be done, either. There are three more AFC teams (Buffalo, Cleveland, and Tennessee) that will likely seriously consider a quarterback change in the weeks to come, both out of interest in seeing another candidate and lack of interest in seeing their current starters screw up any further. Nothing is more exciting for a bad team than rolling the dice with a new quarterback. The only thing more fun than that is seeing your bad football team become a good football team. And the quickest way to get good fast is to make a massive upgrade at quarterback. More changes are on the way. Yes, if you want to be pedantic, some of the players who were involved in this game were not on these teams in February. You still get the idea. Most recent player to pull it off? Legendary clutch quarterback … Josh Freeman, who responded to a Conservative Ron fourth-and-1 punt from near midfield by driving his team 80 yards in 42 seconds without any timeouts for a touchdown, then hitting the two-pointer to tie the game before leading an 80-yard game-winning touchdown drive on the opening possession of overtime. That was less than two years ago! Not counting the kneel-down they took after fielding the kickoff at the end of regulation as a drive. The immaculately named Wreh-Wilson did not live up to his stupendous moniker Sunday. Matched up against Green for most of the afternoon, he struggled mightily. He committed two pass interference penalties, including one in the end zone to set up a Bengals touchdown. An illegal-use-of-hands penalty gave Cincinnati another first down, and a face-mask penalty from Wreh-Wilson on punt coverage pushed Tennessee’s offense back 6 yards. Trust me, the Titans didn’t need any extra resistance. That total doesn’t include Derek Carr, who came in for expected Raiders starter Matt Schaub just before the start of the season, or Derek Anderson, who started for an injured Cam Newton in Week 1 without any prayer of taking Newton’s job. What a dumb time to call for the fake spike, you know? Why put a trick play on tape when you’re down 34 points in the fourth quarter? I mentioned this, and Jaguars fans pointed out that the Jags ran it during the preseason, which really only makes it worse. Why remind teams that are unlikely to check out a ton of preseason tape later in the year that you have this trick play in your playbook? Maybe Bortles called it on the fly, in which case, I can’t really fault the coaching staff. And no, the Jaguars probably aren’t going to have a ton of meaningful games this year. But I guarantee they could find a better spot than this one for the fake spike. In the eight quarters between the second half of Week 1 and the first half of Week 3, the Jaguars were outscored 105-10. On the whole, the Jaguars have been outscored by 75 points through three games, which is tied for the seventh-worst point differential through three games for any team since the 1970 AFL-NFL merger. Well, except for Jared Cook, who responded to dropping a touchdown pass by shoving his quarterback on the sideline. All I’m going to say is this: If Steve Smith managed to make it through seven years with Jake Delhomme without punching his quarterback once on the sideline, you should be able to make it through a month with Austin Davis, Mr. Cook. Why Is the Premier League Table So Weird Right Now?